Low rolling resistance (LRR) dual tires will save significant amounts of fuel when compared to tires that are not designed for low rolling resistance. Some of the costs to operate low rolling resistance tires may be higher than those of non-LRR tires, but those costs are recovered over the life of the truck. Cost per mile of tires has traditionally been defined in terms of initial purchase and tread life. However, the cost of fuel the tire consumes because of rolling resistance is five times greater than the initial purchase price of the tire. Rolling resistance makes up 30-33% of the total fuel cost of a Class 8 truck or about $0.21 per mile. The typical purchase price of the tire is about $0.04 per mile. The Confidence Rating indicates a high confidence in low rolling resistance dual tires to save on fuel costs signifying a good case for adoption. If tire rolling resistance accounts for about one-quarter to one-third of truck fuel consumption, a 5% rolling resistance improvement would produce a 1.3–1.7% improvement in fuel economy. There is a large range of rolling resistance in commercially available tires today, so the fuel efficiency will vary widely. A total cost of ownership calculator is available below. California currently requires LRR tires, but it is believed requirements will spread across the country. The SmartWay list of LRR tires provides a differentiator to non-LRR ones. LRR tires are priced similarly to, and in some cases less than, non-LRR tires. Fewer 1/32-inches of rubber on the tread face can cause lower life. Advances in tire design and tread compounding have extended tire life. Most fleets use the SmartWay verified list as a guide for finding LRR tires. Distributors or tire company representatives can help point fleets to tires that may be best suited for their application. Large fleets may run their own tire tests to determine which LRR tires make the most sense for them. Premature tire wear is often the symptom of some other problem on the vehicle whether the tires are non-LRR or LRR. Simply replacing a prematurely worn tire with a new tire without addressing the underlying problem will result in premature wear of the new tire as well. 56.8% of survey respondents indicate they currently use LRR tires. 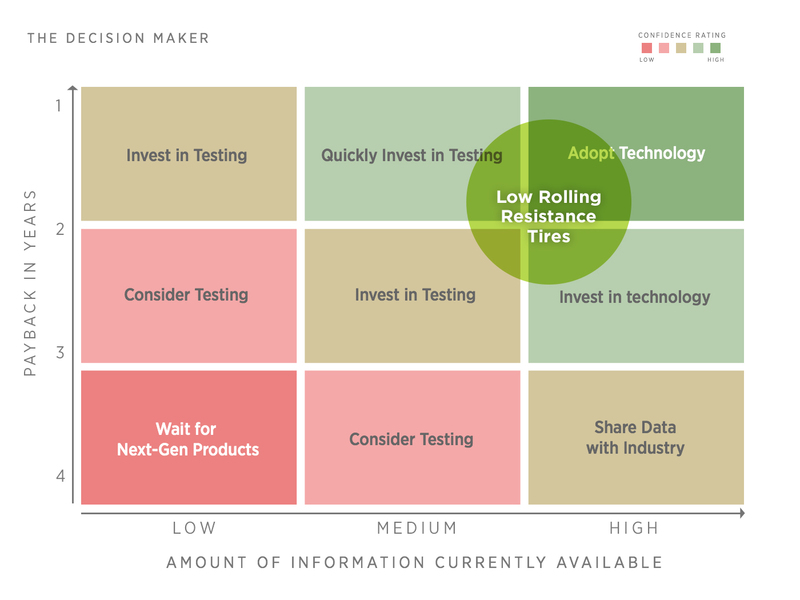 4.5% of survey respondents are testing LRR tires. 68% of respondents are very or somewhat satisfied with tread life. Fleets expect to pay a 10% premium for LRR tires. 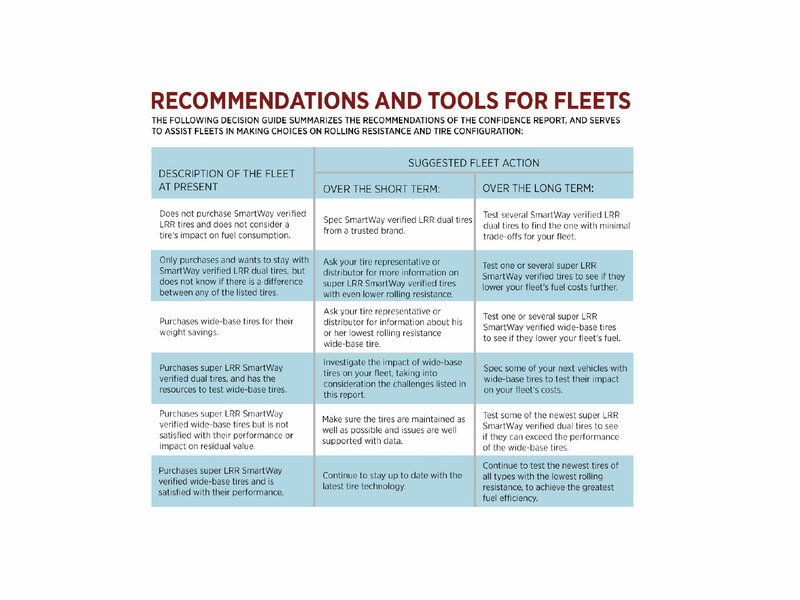 A Decision Guide summarizes the study findings to assist fleets in making decisions about low rolling resistance and wide-base tires. A Total Cost of Ownership tool calculates life-cycle costs of different tires fleets are considering. Low rolling resistance dual tires save significant fuel. The purchase price of LRR tires may be higher than non-LRR tires, but these costs can be offset through fuel savings when considering total life-cycle costs. Adoption rates of LRR tires in over-the-road trucking are high and will continue to increase. Along with even lower rolling resistance tires, purchase price and traction are being improved with new tire development and availability. The perception of traction issues and driver acceptance problems are worse than the reality. The MPG gap between the lowest LRR tires and the best wide-base tires has been reduced over the last five years.